For many of us, the months of August and September are a signal that summer is ending. If you’re a child, it’s a time for back to school shopping and the first day of a new school year. Growing up, one of the most exciting moments about starting school again was back-to-school shopping. However, many children aren’t afforded this opportunity because of their financial needs at home. This past August, I had the privilege of coordinating The Dreamville Foundation’s Inaugural Back To School Supply Giveaway, held in Fayetteville, NC. 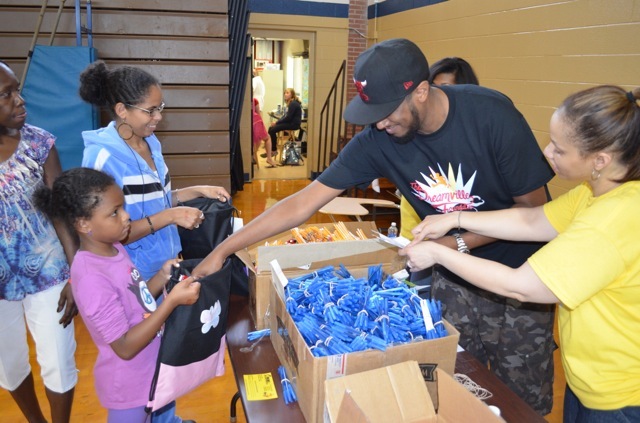 During this year’s event over 700 children visited the gymnasium of EE Smith High school and were able to go ”shopping” at various supply stations which included, backpacks, writing utensils, notebooks,art supplies, etc. The event was sponsored mainly by the foundation itself, with contributions from Office Depot, Sprayground, Pepsi, Down Town Locker Room, ICM, and Julep. The Dreamville Foundation created this event to give the youth an opportunity to be “Set-up for Success,” providing them with the essential tools in preparation for a successful school year. This event was a major success for the foundation and myself because there is no greater feeling than when you give back to others in the community.